Although there are many similar questions to this one, I wish to get your attention to this specific board layout. 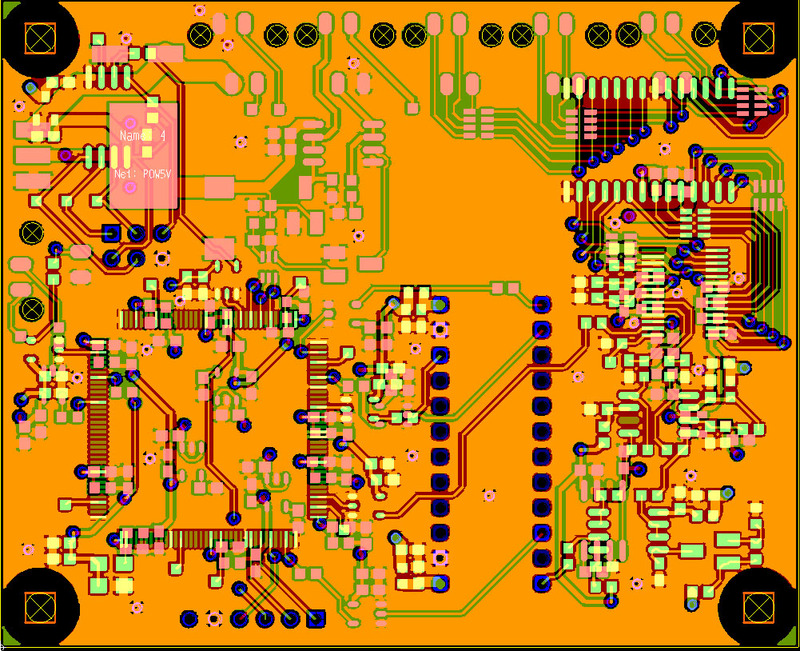 The main power on the board will be 5V, and one of the layers is dedicated for this. However, the board will be connected to a 12V power, so I am using an LDO to drop the voltage to 5V. Keeping in mind current flows, the ideal placement of the LDO would, probably, be at the center of the board, however, I placed it on the top left (see the bottom plane layout). Is this acceptable placement or there is a better way in this case? 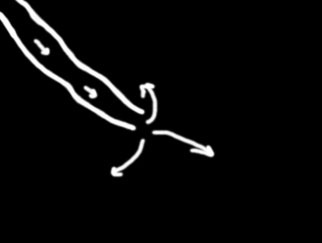 Maybe I should route a fat trace in the power/ground planes to the center of the board, so all the currents spread/return from/into the center like on the figure below? Should the ground from the 12V connector and ground LDO pin originate from the same point, or it's ok to connect them to ground plane at different points? Is it useful (in my case) to have some ground plane islands on the top and bottom signal planes in addition to the separate ground plane layer, or should I limit the top copper plane to only certain areas? My biggest concern is bypass caps and GND pins connection. I did try to place the components so the negative pins go outward and connect to the larger top GND plane areas. However, would it not be better to place via right next to the GND pins so they connect directly to the GND plane layer? Speaking of GND via: I tried to place them close to several ground pins at once to make a local GND 'star' connections. Again, would it be better to use more GND via at each GND pin, or that is unnecessary? Does it considerably increase the manufacturing price? 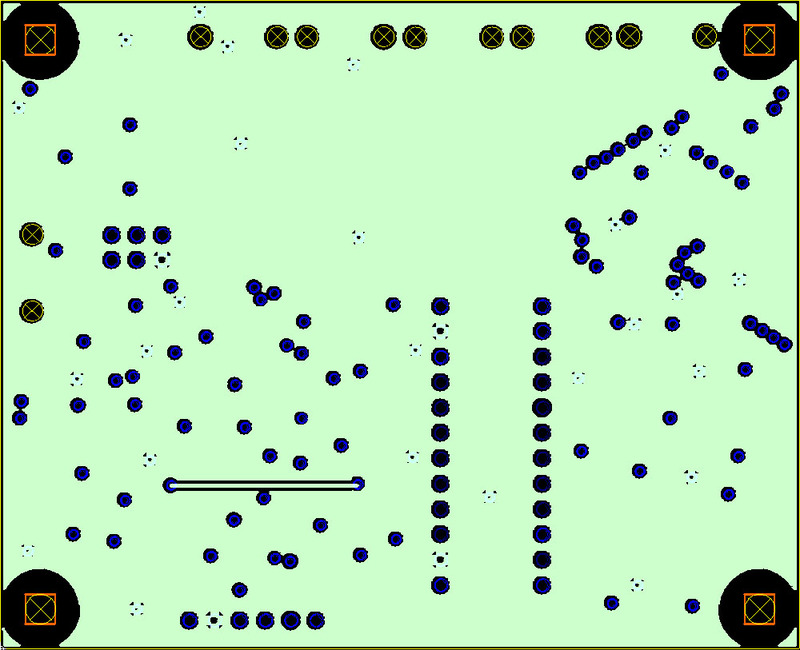 I also tried to spread additional GND via equally spaced across the entire board area. Is it a good practice? How is the efficiency vs. manufacturing price? 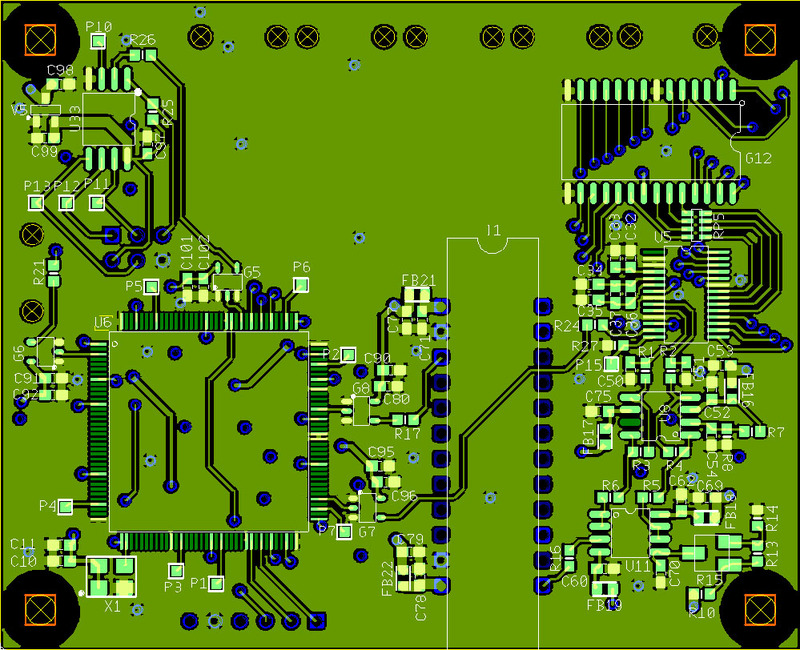 Should I make a small split in the GND plane layer somewhere between the ADC and a SN74 buffer? So to say I separated digital and analog grounds? 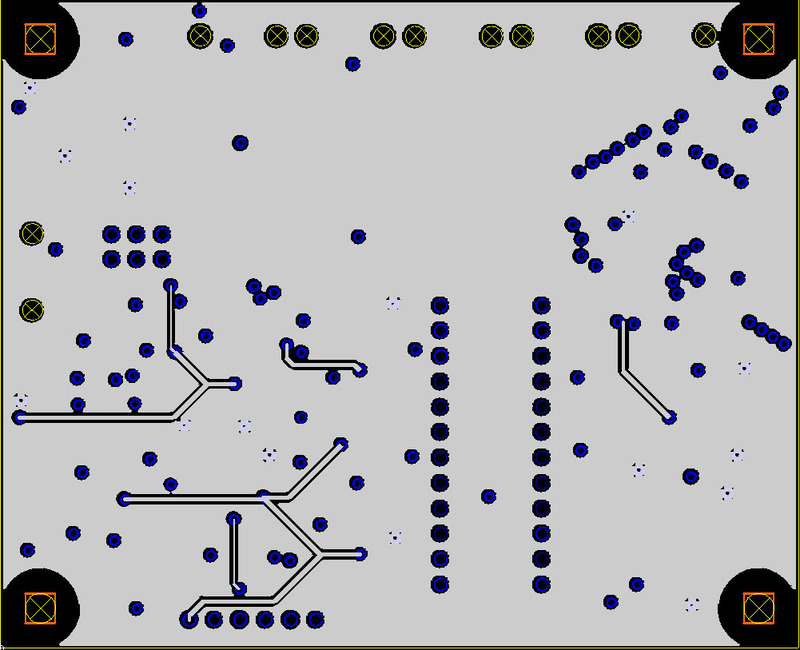 Please, comment on how I could improve my current PCB layout. Main power: 5V and additional small LDOs (3.3V, 1.8V) designated with the letter V.
To the left: CPLD, small uC. To the right: OpAmp, Diff Amp, ADC, SN74 buffer (bottom to top). Buffer gates designated with the letter G.
I will remove small unconnected islands of copper at last. I'm not sure that I know the best way to build the board, but I know what I would do. The location of the 12V-to-5V regulator, whether linear or switching, will not matter. The corner of the board is fine. I would not bother with filling either top or bottom of the board with ground planes. The impedance of the signal traces is defined by the internal planes, not the extra copper you pour on the outside. The extra coper isn't shielding internal signals, all that is underneath are power and ground planes. Instead, connect ground and power pins of components directly, as close as possible to the pin, to the planes. Don't share power and ground vias between different devices. One via per pin minimises noise on the pin and routing distance to the ground plane. If you are so worried about the manufacturing price that a few vias are going to be significant, you must be shipping in very high volume, so you can prototype a dozen different layouts to optimise it. If this is a one-off, the biggest cost risk is that you don't get it right first time, so be conservative and use lots of vias. Put a via by every component ground pin (not necessarily every component signal pin that happens to need routing to ground). Minimum noise on power and ground planes comes from effective decoupling. High frequency noise is minimised by using physically small ceramic capacitors and keeping the power and ground vias close together - underneath the capacitor, if possible. The cross sectional area of the loop from power plane up through via to capacitor, along capacitor and down through via to ground plane, places the lower limit on how effective the decoupling is. I would definitely not put any splits in the ground plane. Instead, if there are analog signals sensitive to noise, I would not route digital signals close to them. 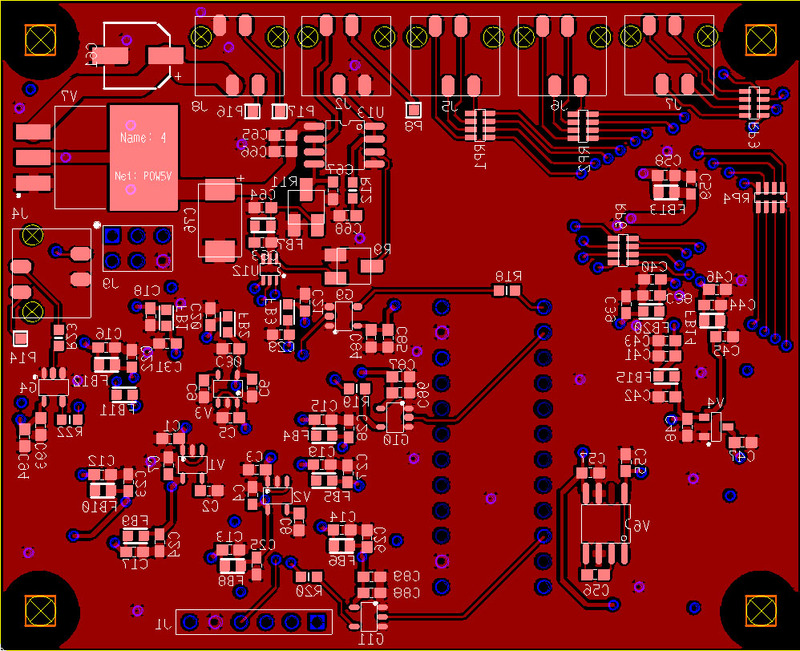 I would try and keep those sensitive analog signals just on the top layer if possible, no vias to the bottom at all. If I can isolate an area of sensitive connections all together on the top layer, I would route a single loop of trace all round there on the top layer, and connect that loop at one point with a via to the ground plane. That approach has worked well for me in the past with very sensitive signals. And finally: it is conceivable that some clever technique of sharing ground connections might help noise in the analog wiring, but you'd need to know the exact circuit and think very hard about it to be confident. These rules of thumb have worked pretty well for me. I think the general practice should be to maintain a solid plane where possible, and then place noisy components near the periphery so they don't contaminate sensitive nodes. You can place your LDO wherever you want if you are going to put it's output to the plane. The periphery, near the 12V header might be a natural place for it. Be sure to strap it to the plane well with plenty of vias. Conversely, you can put 12V in the plane, and the get your LDO 5V at the few points you need it with thick top copper. Not the answer you're looking for? Browse other questions tagged power pcb-design ground-plane pcb-layers or ask your own question. Should vias be used for every GND connection? Top layer ground flood on 4 layer board - how should the ground planes be connected?